Alice bands, orange bladed boots and socks worn over the knee. Mansions in Cheshire, WAGs and written-off Ferraris. Referees with headsets, fourth officials, and an incomprehensible amount of stoppage time. There is only so much a true football fan can take, and in Heroes, Hairbands and Hissy Fits, Mark Chapman (aka Chappers) gives full vent to his feelings, as only the host of a football phone-in can. Football phone-ins are on the hitlist too, by the way. It is football as we know it, told from the heart. With his trademark down-to-earth wit, he takes aim at everyone from Sepp Blatter to MOTD, kit designers and replica shirt wearers (don't put your age on the back of the shirt, lads), trophy presentations and tournament draws. 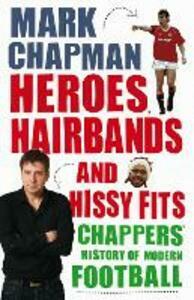 From his first footballing memory to watching his son grow up idolising Premier League millionaires, Chappers' book is a timely tirade as well as a love song to the beautiful game.